I Love You More Than Carrots: Fabulous Flashback Friday, Volume 6! Ok. I apologize in advance for being a terrible blogger. This Flashback Friday was really the Flashback Friday that I meant to post last Friday but just never got around to putting the final touches on. Ya follow? So yes. I cheated a bit and rather than post a late FF, I'm just pretending that last Friday never happened. Even though it was gorgeous weather and I may or may not have been sipping vodka lemonades on my deck after work. As a tot, I loved me some Strawberry Shortcake and Custard the Cat. I can remember selling my Strawberry Shortcake figurines in a garage sale a few years back. Believe it or not, they still smelled faintly like strawberries! I'm a little perturbed- it looks like a "new and improved" Strawberry Shortcake will soon be released with a few.. upgrades. The new Strawberry Shortcake will be skinnier, have fuller, longer eyelashes and no longer be accompanied by her kitty pal, Custard the Cat, but rather by a cell phone. Seriously? Seriously. I will admit, I had to google "alien girl who's dad was a crystal, TV series of the 80's" so that I could remember the title of one of my favorite TV shows. Now do you remember what I'm talking about? I know the title must've thrown you for a loop! Each night, Evie Garland would speak to her father through the "cube" that would sit on a table somewhere in her bedroom. The cube was given to her on her 13th birthday, around the same time that little Evie realized she had supernatural abilities! The most notable of these abilities was the power to "freeze" time by touching her two pointer fingers together. As with many shows in the 80's, each of the episodes often had a moral as Evie learned to use her powers appropriately. Simply fabulous. "Would you like to swing on a star? Carrying Moonbeams all in a jar?" 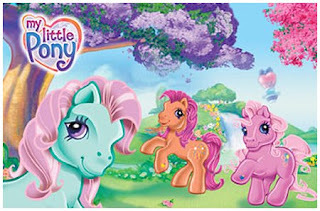 Did you know that My Little Ponies were once more popular than Barbie? They were my favorite bathtime buddies. My mom started hiding them from me when I started cutting off all of their hair. I guess she thought they might be a collector's item some day. Now it just looks like they went through chemotherapy. Did anyone own the My Little Pony dance studio? Yeah, that's right. You could slide their little pony feet into slits on the dance floor and then turn a little spoke forcing them to do little pony pirouettes. Loved it! Alf. From the planet Melmac. Who's spaceship crash landed in the backyard of your typical suburbanite family, the Tanners. Who spent much of his time trying to capture the family cat and make a meal out of him. I can't even finish this post without laughing out loud a little. How could you not love Alf? I certainly did! I love your Flashback Fridays!!! I watched Alf re-runs last night! I have a serious love for all things 80's and 90's...remember Garbage Pail Kids? Just found your blog and LOVE it!! This was so cute!!! 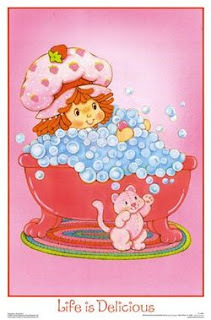 strawberry shortcake is so CUTE,but really no cellphone,enough on barbies,why on her again? Oh man I love Your Fabulous Flashback Fridays! They are the best! I still have my, my little ponies! I totally forgot about Out of this World! I loved that show!! You remember the best of the good old days. I loved eating warheads and I remember sucking in my cheeks and squinting my eyes because they were that sour. I loved my strawberry shortcake figurines and the fact that they had a scent. This is also the reason that I loved my scratch 'n sniff stickers! 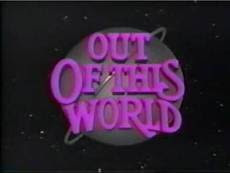 OMG I loved out of this world!!!!!!!!!!!! great, GREAT show!